I was hesitating a bit as I couldn’t decide from where I better depart for Mont St Michel. Right from Paris? Or from Rouen? Rouen was also my top choice due to my wish to see Claude Monet’s garden, but unluckily one day before my departure to Rouen, I had to cancel the trip to Givenchy-Vernon. From Rouen to Mont St Michel was a 4-hour long ride in the train plus another 15′ in the shuttle bus from Pontorson to this site. Anyway I was so excited to see the sight of MSM (i.e. Mont St Michel) from far in the train and then from the bus when it was approaching. It looks so stunning on the blue sky background! This remarkable mediaeval walled city, crowned by its great gothic abbey on the top, has been built on a small granite outcrop standing all by itself in the river Couesnon. I booked a room at “Le Mouton Blanc”, an auberge right in the heart of Mt St Michel, I really want to experience a night inside this 1000-year old mediaeval city, it was quite crowded till late at night. The main entrance to Mont St Michel. I can’t remember how late when I took this photo, most tourists already back to their hotels, the MSM’s inhabitants also back home, all shops closed, except some restaurants. By the way, I was told half of hotels, restaurants, shops, museums here, all belong to one man – the owner of a group company named “La mère Poulard” ! 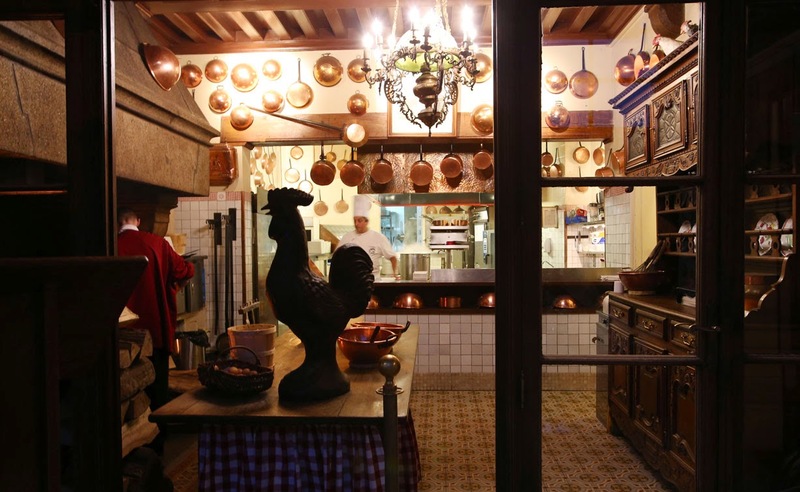 The restaurant “La Mẻre Poulard”, right at the entrance to MSM, with open kitchen decorated with the copper cookware. I didn’t have chance to taste the “omelette of La Mère Poulard”, but what I concern was the size of the omelette, it’s at least for 2 or 3 people, who really love butter omelette. By the way, “La Mère Poulard” was a honour name given to a woman – Annette Poulard, living here since 19th century, she was famous with her cooking skill, especially the omelette that she always prepared for pilgrims in MSM. I didn’t try the omelette but found this video – interesting to watch the famous “l’omelette au feu de bois” at the restaurant “La Mère Poulard”. Le Mouton Blanc – my hotel but I stayed in another building with the window to the cemetery! this’s the way to my hotel thru this gate…. and the corridor to my room with a big window to this cemetery! Grand Rue – a main street in Mont St Michel, going uphill…up to the abbey on the top. the stairs on the right leading to the main entrance of the abbey. I arrived here around 5:00 pm, I missed all museums, next morning I had to leave, so I woke up at 6:00 am as I really wanted to get the feelings of walking around this 1000-year old city, before sunrise, but I was not alone, I met some other visitors in hurry to the abbey for morning religious mass, I met an athlete, in his 50s, running up and down and workers cleaning up the city. Restaurant in the backyard terrace, the abbey in the background. I should mention about the tide, actually staying here only for one night, I have no idea when is the high tide, when low, but on the site of MSM you can find the tide schedule with the exact timing when the sea water is rising, when is falling and with the warning “It’s extremely dangerous to venture alone into the bay including immediately close to Mont Saint Michel”. So be cautious! Mont St Michel is an unique magnificent walled city with a thousand year old history, I didn’t have enough time to explore it, I arrived around 5:00 pm when most museums, abbey were closed and next morning I had to catch my early train at 7:45 am, no where was open yet. The only thing I enjoyed was my morning walk around this small but so special place. When I walked to the bus station, looked back to Mont St Michel in the morning mist, admiring it as one of the best moments in my life. Now I’m heading to Blois, a famous town with many castles along the river Loire.